Barbara Turley serves as an inspiration to anyone who is currently working a job they like, yet want to quit because of a desire for the kind of freedom that comes from being your own boss. Barbara had a solid career in the world of finance. The only problem was the incompatibility with the way she likes to work and the way the corporate world expected her to work. Like many people I know, Barbara tends to work in bursts. However for a burst to happen, she needs time to not work, to recharge and do other things for days at a time (recovery is just as important as performance – look up the Ultradian Rhythm for more on why this is). A chance trip on a Virgin flight in Australia introduced her to my EJ blog (I was featured in Virgin inflight magazine many years ago), which opened the door to the world of making money from blogs. She read a lot of the articles here on EJ, and later joined my Blog Mastermind program. Barbara decided to take the leap, quit her job, and began implementing her strategy to become a “women and wealth” coach, helping other women with their financial security. Despite her non-web savvy background, Barbara, with the help of a tech person, went on to launch a blog (EnergiseWealth.com), a podcast and even an online TV show. At the moment Barbara focuses on one-to-one coaching, charging $2,000 a month to help women with the subject she has the most experience with – financial management. By the time you listen to this interview her first digital training program may also be available as she expands her business. As Barbara explains during the interview, she finds many of her coaching clients at networking events, however, most of the “selling” of her services happens automatically online. 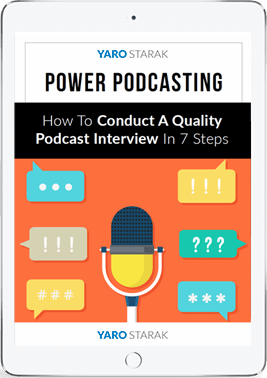 Her potential clients study her blog, go through her seven-part free video training, and listen to her podcast. This content acts like a “background check”, so Barbara doesn’t need to convince people that she’s worth the $2,000 a month coaching investment. This is another case study that demonstrates how powerful a platform built on a blog can be for almost any kind of business. It’s especially effective for coaches or any person who teaches and uses their personal brand to sell. Enjoy the interview, and when you are ready to build your own platform, consider enrolling in the next round of my Blog Mastermind program, just as Barbara did. Please share this interview with anyone you think will benefit. The one thread I see again and again when reading these stories is the idea that anybody can do this. We’ve all started in different spots, many of use being totally fed up with old jobs, which we’ve outgrown. Anybody with a strong desire to be free can make freeing but uncomfortable decisions to make money through blogging to craft a digital lifestyle. I vibe with Barbara in that I create with short bursts, then need break times to recoup. Not working is as important as working. Sleeping is as important as working. I have my Eureka Moments 99% of the time AWAY from the computer, because even though I thoroughly enjoying working online it’s when I’m starting out at the ocean across the street here in Fiji, or when I’m running through ricefields in Bali, where I’m completed detached from outcomes, and in the moment. Folks, you can do this. Be hungry, build up your belief in self and find a stunningly successful mentor like Yaro to lead you in the right direction. Even if you have year’s worth of experience as an entrepreneur you need coaching to learn the online bit, and to cut your learning curve. Awesome post as always Yaro. Thanks for inspiring me to blog from paradise. Sure beats being a security officer in Newark, NJ, though that job taught me some sweet lessons too. Enjoy your day Yaro and thanks for sharing your story Barbara. Thanks as always for your insightful reply Ryan, I’m impressed that you listen to all my podcasts! How are you finding the internet access where you are working from? Reliable? Ryan….. I vibe with you too !! The high vibrational frequency of your voice makes me see why you are successful and will continue to reach new heights. Manifestation Nation!! – “Barbara had a solid career in the world of finance” – most of the rest of us don’t have a solid background in … anything, really. – “Barbara, with the help of a tech person, went on to launch a blog, podcast, an online TV show”. Where do we find that tech person? How do we pay them? She found hers in Sydney – what if we live in Bend, Oregon? I don’t, but I live in a small town, and have gone through all three of our marketing agencies. No money left to pay for someone from the city! How did she support herself after she “took the leap” and quit her job? How long did it take her to replace her income, if she has yet? The point is, it takes a LOT more than strong desire to make this kind of success happen. Either you’re insulting our intelligence, or her efforts. I read the whole transcript, and too much is left out. This was less than inspiring. Sorry to hear you were not inspired by this interview. I realise sometimes hearing these kind of stories makes you frustrated because you want all the tiny details. There is only so much detail you can go into with a 45 minute interview, so while I try and ask for specifics from each guest, it’s never going to be super-granular (which is why I recommend courses if you want that kind of detail). I find that difficult to believe. If you have lived life you have have done something. If you are considering publishing online then you must care about a subject enough to want to share it. If you don’t care about anything then that’s a different problem – you need to start doing things in order to have experiences and create knowledge that you can share with other people through avenues like a blog or podcast. You can always learn and teach as you go, that’s what most bloggers do on some level. I can feel your frustration coming through here Susan. A good tech person is must, but you have to find them. We all do. I’ve been through many tech people over the years and I continue to hire new ones. I find them locally, or overseas. I ask on facebook for referrals, I ask my colleagues, I post on elance, I use services like https://codeable.io/. Many of my coaching clients used Joel from blogtechguy.com for help with their blogs. If you have access to the internet, you can find a tech person. One great starting point for wordpress bloggers is http://wpcurve.com/. There are many options! As she said in the interview, she was still part owner of a company and had plenty of assets before she left her job. As for how long it took for her to replace her income, I’ll let Barbara reply with the specific details on that one. Susan all the answers you are looking for are within my blog if you take the time to study it – all for free as well. Good luck! First of all can I just say thank you for commenting and being so honest about how you feel. Sometimes it’s all rainbows and lollipops online full of success stories everywhere that can make us feel frustrated and a bit alone. You probably wouldn’t know from the interview that I too have had many days of feeling exactly like you do – you just don’t see behind closed doors! Despite having a clear vision, strong expertise and a tech person who helped a lot I have days where I am beating my head against a brick wall. That is the reality of building a proper business whether anyone cares to admit it or not. In response to some of the challenges you mentioned – I agree with Yaro and find it very difficult to believe that you have no expertise. That is you totally undervaluing yourself and the experiences you have had in life. Each of us have had situations happen in our lives (positive & negative) that would be extremely valuable to others who might be a few steps behind us. I have no doubt you have the ability to help others in at least one aspect of life or business. You just haven’t hit on it yet or you are not placing any value on what you do know. With the tech stuff … I agree. What a bother it is finding someone. It’s a total pain and even when you do find the right person the results can be frustrating to say the least. Again I have experienced that and despite serendipitously meeting Heather in Sydney – she runs a global online business and has clients all over the world. I mentioned her website on the podcast http://www.autopilotyourbusiness.com and if you jump on there you will find a ton of free content and a very affordable membership option where you get live access to her personally. In this day and age it is very shortsighted to blame your inability to find a good tech person on where you live ! In fact I can guarantee you that the best ones certainly do not live in your town. They are online and who cares where they live ! In relation to the income part of the conversation – I made the decision to be very transparent in the interview about my income so as not to mislead anyone into thinking they can just quit their job and start a blog. As Yaro said above I earn income from other areas. I have spent the past 7 years building assets for myself and, trust me, that was not easy. I took a lot of pain to build myself up to that point and even admitted that when I bought Yaro’s program I was under a huge amount of financial pressure. With Energise Wealth the income that business currently produces is through private coaching alone so the ‘online’ component is not yet income producing. However my online presence has showcased my expertise and drawn private clients to me. I completely agree with you that it takes more than strong desire to succeed … it takes a very positive ‘can do’ attitude, unflinching self belief and a commitment to hunt out the solution to any obstacle that gets in your way. My advice to you would be to cultivate these things and know that falling down is all part of the game. It’s how well you pick yourself in the face of adversity that determines your success. I wish you the best of luck with your endeavours and hope that this has helped you in some way to release some of your frustration. To finish …. you are valuable. Start believing that and everything else becomes much easier. Yes I have to agree with Susan. It does not in any way suggest that any non-technical person can start a high-paying blog. However, i do love the interview Yaro had with Barbara. I am also a little sceptical whether Barbara really makes 100k from her coaching. Nontheless, I have never heard from her before, but thanks for making me aware! When I said she was a non-techy I meant before she started online she barely used the internet, as she explained in the interview. So she had no experience blogging, doing a podcast, or a youtube channel, yet does all these things today, despite her non-tech background. Of course she hired help to get all this done, which is exactly what every non-techy should do – hence we talked about exactly how a non-techy can do it. As for her $100,000 claim – do the math. If you charge $2,000 a month for one on one personal financial coaching you only need five clients to make $10,000 a month – $120,000 a year. Of course to charge that much for coaching you need really good positioning, which is exactly what using all the online tools is about – demonstrating your expertise through blogging, podcasting and video. Thanks for your comments and for listening to my story. I know what you mean about the non techy bit. I guess what both Yaro and I were trying to convey is that you don’t have to be a techy to succeed online. I chose to hire someone to help me. Could I have done it by myself? Sure I could have. I could have spent my other precious resource of time instead of money to develop the skills myself but I decided I wanted to get up and running very fast so I hired it. As far as my income goes … just like Yaro said below – Do the math. I was very transparent on the interview and stressed that my income right now is from private coaching alone and some of my clients are people I already knew. You haven;t heard from me before because I literally only started Energise Wealth in late 2013. Everyone is only hearing from me now as my profile is building and I am working quite hard at that bit !! Susan, I’m glad that you see the holes in the lottery ticket dream lifestyle that is widely being sold on the internet. Yes many online do under estimate the intelligence of their potential client and the general public. Having said that though, Yaro’s blog is somewhat better than many of the other blogs and sites that are around. Experience really is the best teacher and today’s technology is kind of an equalizing factor for someone that lacks capital equity (money). They can make up for it through plenty of sweat equity. In other words lots of work. When I started online virtually nobody wanted to be involved when they realized I wanted to accept credit card payments online and the 1 company that wanted to back me wanted a $25, 000 deposit. The deposit was there to protect against fraud and charge backs. Today there is PayPal and other e-wallets or payment mechanisms. Today it’s much easier for someone to create an online presence than it was in the 1990’s but you either have to hire someone that is technical or you have to learn it yourself. The other option is to partner with someone. The typical result is failure for the business startup and not the utopian $100, 000 dream that is outlined here. Also for a professional from the world of finance $100, 000 is a drastic pay reduction. Online anyone can claim pretty much anything, just call it marketing. Only the tax authorities really know. My goal isn’t to sabotage or discredit anyone, it’s just to offer an alternate viewpoint. Thanks again to you Yaro for putting up with me and my comments and I really respect that your comment section is fairly wide open. Thanks for your input Dennis. It’s hard to imagine a time without services like Paypal now. Things certainly were a lot harder just 15 years ago. I remember using my father’s “click-clack” credit card processing machine to manually process card payments on my first e-commerce site. I also had kids send me actual money in the mail to pay for the cards they bought from me – like five dollar notes! As you noted today you can solve most issues with technology, if you are willing to put in the work to learn how to use it and hire help when you need it. I still get frustrated with it on a daily basis though! This story is really inspiring. You don’t need to be a technical giant to start your online business. And even if you are then also you can’t manage all the tasks alone. Take the example of Jack Ma who even doesn’t know how to create a powerpoint presentation. But he is the owner of Alibaba.com and the richest person of China. The successful e-entrepreneurs know the skill to handle and manage the tasks effectively. I really liked the Barabara’s story of achieving her goal. A non-techy girl has started a blog and got success. it’s amazing to know about it. All the beginners should read this post and should see the interview of Barabara. This story can inspire many people who are working but have something in their mind that they could the work of their choice. Thanks for making us aware about Barabara. Thanks so much for your supportive comments and glad to inspire some people out there to think differently – just like Yaro inspired me at the start of my entrepreneurs journey !! Very inspiring story about Barbara for me .I want to say something that everybody can achieve their goal but they have passion and zeal in their mind .